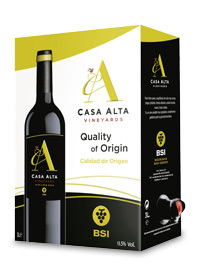 Casa Alta is made of Monastrell grapes. Before harvest time, our enologist made a maturity evaluation process to get the exact days to do haverst some days before In order to obtain a moderated alcoholic degree. Once in the bodega, a careful vinification is done with a short maceration period for 4 days at a controlled temperature. To preserve the freshness of a young wine, it is stabilized and bottles few months after its elaboration. All kind of meats: red and white meats, beef stew, cured pork meats, roast duck and grilled chicken.